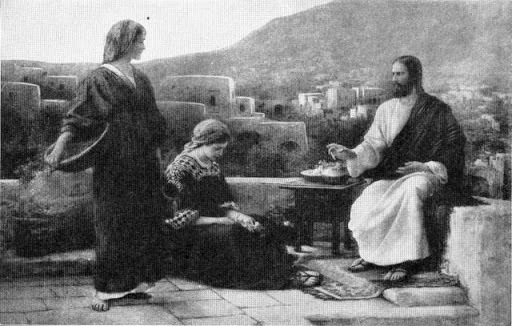 As Jesus and his disciples were on their way, he came to a village where a woman named Martha opened her home to him. She had a sister called Mary, who sat at the Lord’s feet listening to what he said. But Martha was distracted by all the preparations that had to be made. She came to him and asked, “Lord, don’t you care that my sister has left me to do the work by myself? Tell her to help me”. We live in a fast paced world. We have so much to do and so little time. We go to work each day. When we come home there is more work that needs to be done – go to the grocery store, clean the house, cook dinner, help kids with homework, mow the lawn in the summer and shovel snow in the winter. If we’re lucky we get to sit down at 10 O’clock for an hour before bed. At that point we are so exhausted we fall asleep in the chair. The next morning we get up and do it all again. Do you ever wonder if it is all worth it? Where will it all end? Is this busy, ho hum existence all there is? Many times I hear people say, Sunday is the only morning I have to sleep in or to just stay home and relax. I just haven’t been able to make myself get around for church. How is it that we make time for all the things we consider important on our life schedule, but forget the one most important thing we “need” to do, and that is spending time with the Lord. We forget that all we are and all we have belong to God. We get so wrapped up in our jobs, our homes, our family and friends, our budget, and our fun and recreation that when it is time for church we are too tired. These things are all important to our life and existence here on earth but without God we are nothing. God makes us who we are. He controls our lives and the universe. If I die today none of the earthly stuff I have will matter. I won’t need the new clothes. I won’t need sleep. I won’t need that party I was planning. I won’t need to plan dinner. The money I have in the bank will mean absolutely nothing to me. I won’t have to worry about the homework, the housework, shoveling snow or mowing the lawn. If I die today, I will be leaving that all behind. I will be off to bigger and better things. If I die today, I will be in heaven. I will meet the Triune God face to face. I will view His throne and the mansions He has prepared for me and all His faithful believers there. I will be reunited with family and friends who have died in the faith and gone before me. I will no longer have to worry that I have enough money to live on. So what is that one most important thing you and I need for this life and for the life to come; the one thing we can never be okay without? If you die today, do you know for sure where you will be? Will you be in the presence of God, or will you be forever separated from His light and His love? Martha’s sister Mary had the answer. She wanted to listen to Jesus first. She was hungry, not for physical food, but for the life-giving Gospel that only Jesus could give her. She knew in her heart that He was the reason she was alive. He was her beginning and her end. You and I also need to crave and hunger for the life-saving words of Jesus. We may be able to squeak by here on earth without Him, but eternity separated from His presence, will be a lonely and desolate place, both physically and emotionally. Prayer: One thing’s needful: Lord, this treasure, teach me highly to regard. All else, though it first give pleasure, is a yoke that presses hard. Beneath it the heart is still fretting and striving, no true, lasting happiness ever deriving. This one thing is needful; all others are vain. I count all but loss that I Christ may obtain.